This volume adopts an interdisciplinary approach. The study of the workplace is approached from the standpoint of industrial sociology, industrial relations, industrial anthropology and other related disciplines. It includes contributions from economists and psychologists as well as from sociologists. The theoretical and practical issues raised, are, however, central to the sociological tradition of Marx and Weber in that they concern the meaning of human and social phenomena and their relevance to resolving questions of moment in industrial and industrializing societies. Notes on Contributors Introduction 1. 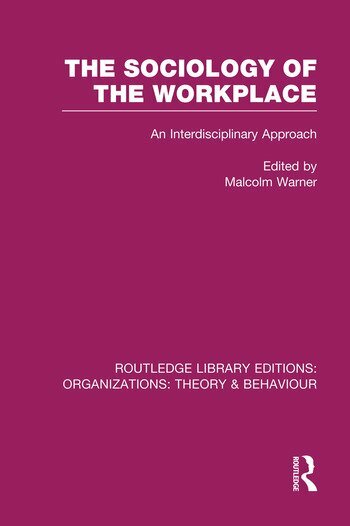 Research into Workplace Industrial Relations: Progress and Prospects Stanley Parker 2. A Behavioural Analysis of Bargaining Andrew W Gottschalk 3. Cheap at Twice the Price? Shop Stewards and Workshop Relations in Engineering Edward Owen Evans 4. Perceptions, the ‘Principle of Cumulation’ and the Supply of Labour Dan Gowler and Karen Legge 5. Technology and Other Variables: Some Current Approaches in Organization Theory Celia Davies, Sandra Dawson and Arthur Francis 6. The Task Analysis Framework in Organizational Analysis Peter Abell and David Mathew 7. Computers and Supervisors Keith E Thurley 8. Chance, Punters and the Fiddle: Institutionalized Pilferage in a Hotel Dining Room Gerald Mars 9. Relative Deprivation, Occupational Status, and Occupational ‘Situs’: The Theoretical and Empirical Application of a Neglected Concept Earl Hopper and Adam Pearce 10. Industrial Conflict Revisited Malcolm Warner. 11. Sociological Imagination and Industrial Life John E T Eldridge Index. Malcolm Warner is Professor and Fellow Emeritus, Wolfson College, Cambridge and the Judge Business School, University of Cambridge.